Give me your opinion about this League in the end of this post. It's very important to keep the project quality. Concept - Join the biggest teams of various countries, give them the same economy power allowing they equalize their reputation over time. GamePlay - In this format the game should become more attractive, interesting and less boring. It will be very common in the game, verify top teams like Barcelona, Man Utd and other, getting down in their divisions, while you will see team getting up from down divisions and reaching the top. If you like to start a career without a team or with small teams and then going up, this is the best way. Country - This league was created on Wales that now is called "País Supremo" (Supreme Country), which was removed from United Kingdom. It was added new languages, like spanish, portuguese, italian and french besides to keep the english. Cities - It was created new cities and regions to add the teams, splitting the teams by speak languages. If a team comes from a different native language from the above said, the team was set at english area. Reputation - It wasn't edited anything about it in the teams. Divisions - There are 8 divisions, being 7 of them made with 20 team each and 1 division made with 40 teams. It's downgraded 6 team from each division, except from the 8th division, where no team is downgraded. 1ª Cup: It's the main Cup, played by team from 1ª, 2ª and 3ª division. Give you a place on Champions League. Champs Cup: Played by 16 team which was classified by all division (1ª and 2ª place from each one).The first round is played in group style, passing then to playoffs style on the next rounds. The money gain is good if you classify to the next round. 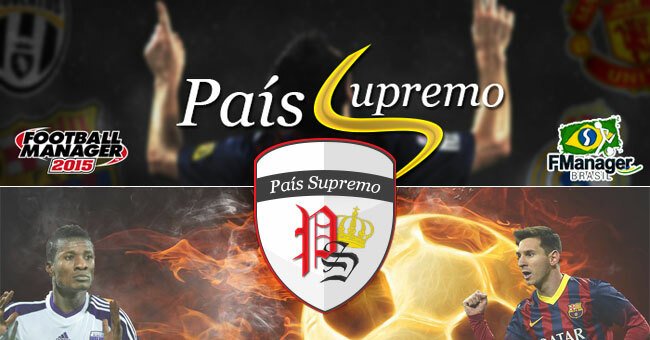 If you will play "Pais Supremo" I suggest you to add other league, like Spanish, Italian, Brazilian and other to make the game more interesting. The team that was kept on the original country is powerful now. IMPORTANT: You must select "Supremos" as 2nd nationality to be able to get a job in this "country". Extract the downloaded file using 7-Zip for Windows or The Unarchiver for Mac. Notice: There may be two "Sports Interactive" folders in your Documents library. If this is the case then put it in the one which has your saved games inside. A little pop-up window will come up that says there is X enabled editor files. Select "Custom" from the editor data drop down menu and choose the databases you wish to load in your new save. Keep Getting Crash dumps everytime i try to select in editor data section blah blah... ?